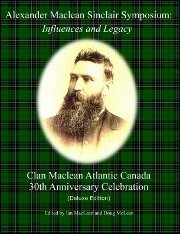 A book documenting the Alexander Maclean Sinclair Symposium and Clan Maclean Atlantic 30th Anniversary Weekend is now available. This book contains the full presentations made by the speakers at the AMS Symnposium, as well as the Clan Maclean Atlantic 30th anniversary celebrations. This book is an excellent resource not only for members of Clan Maclean Atlantic, but for anyone who is interseted in one of the Clan's greatest historians, Alexander Maclean Sinclair. The wealth of information contained in the presentations make this book worth far more than the price. 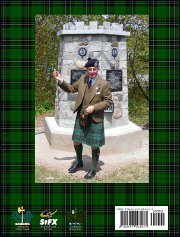 In addition to the symposium presentations, the book contains a 30 year history of Clan Maclean Atlantic, information about the Clan Maclean Atlantic Cairn (including stories about the stones contributed to it by members), information about the events of the 30th anniversary weekend, and numerous photographs. Two editions are available, a deluxe edition, and a basic edition. The only difference between the two editions is that the deluxe edition is in full colour, while the basic edition is in black & white. Either edition may be purchased through Clan Maclean Atlantic's lulu.com page here. All profits from the sale of these books will be used by Clan Maclean Heritage Trust and Clan Maclean Atlantic to further help preserve and promote the history and heritage of Clan Maclean.